Stroll through the foyer and into the great room where the big white windows and high vaulted ceilings give the space a light and airy feel. The beautiful fireplace warms and delights, keeping this large space cozy. In this open concept floor plan, the dining room is just beyond. This space is simple, yet it shows that no detail was left unattended to. From the molding, to the columns, to the chandelier, you experience elegance at every turn. The kitchen is just the right size to make cooking convenient without being overwhelming. The breakfast bar sits on top of custom cabinetry and gorgeous countertops, with updated stainless steel appliances completing the package. Just off of the kitchen is the home’s screened in porch, ideal for sipping your coffee and comfortably watching the sunrise. On the other side of the main level is a master suite in the true sense of the word. A beautiful bedroom leads straight out onto an extensive deck, but the walk-in closet and en suite bathroom are exactly what homeowners’ dreams are made of. Two sinks with plenty of counter space, storage galore, a large tiled shower, and a soaking tub are all features of this master bath. The exquisite detailing is an added bonus. 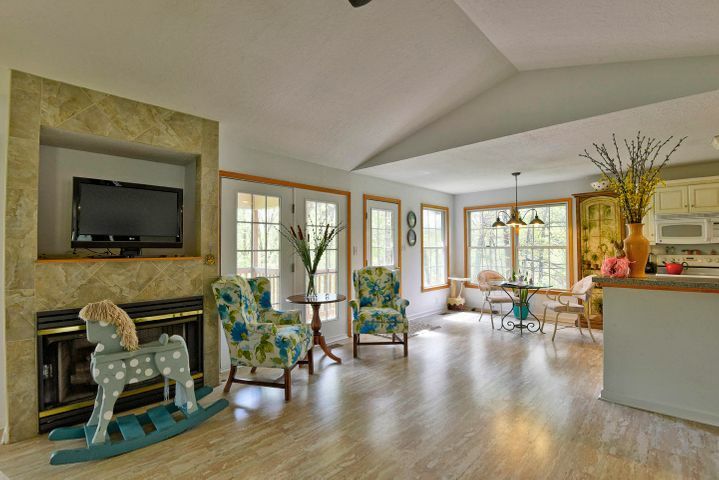 On the lower level, things get cozy in a charming family room complete with stone fireplace. Three more amply spaced bedrooms are located on the lower level as well, and a bonus room is ready to be made into your perfect kind of recreation space. Outside, a beautifully crafted awaits you. Down at water’s edge, a covered boat dock is ready to house your watercraft. Everything about 171 Mountain Shore Drive exudes luxury and charm, and it has everything a discerning homeowner would be looking for. Check it out for yourself. Give me a call today and we will schedule your own personal showing. This classic ranch on 1.3 acres is surrounded by a hopping 670 feet of shoreline. 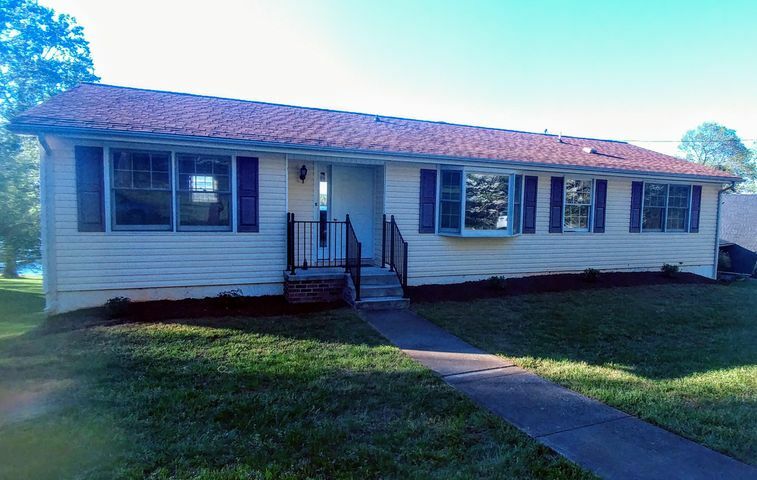 When you get inside, you are greeted by a charming brick fireplace and gorgeous hardwood floors. The great room is open and wraps around the house until it becomes the kitchen. Beautiful cabinetry and tons of counter space are the first things you will notice here. The layout is phenomenal. The master suite takes up the entire portion of the back of the house. The bedroom is quite spacious, but what you are likely to notice is the amazing walk-in closet and amply sized bathroom with shower and soaking tub. Just imagine soaking up the views from the porch on the porch on the main level as you sip your morning coffee. The lower level is just as charming as the main level. 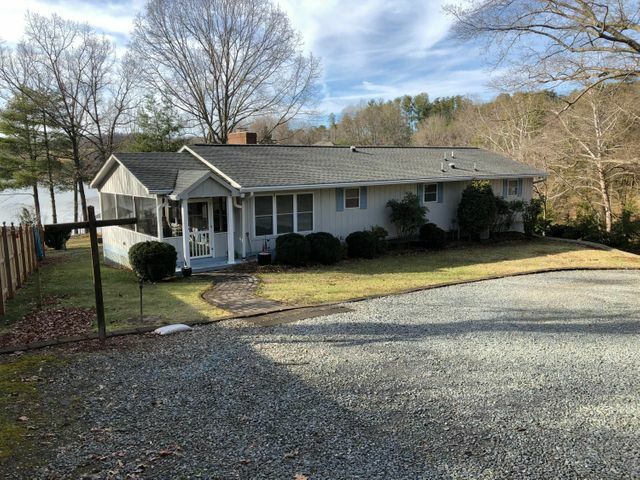 Here, you will find three more bedrooms, which makes this home ideal for bigger families or those who like to welcome their loved ones to Smith Mountain Lake for a visit. The family room on this level is characterized by the same wood floors and charming fireplace you will find on the main level. 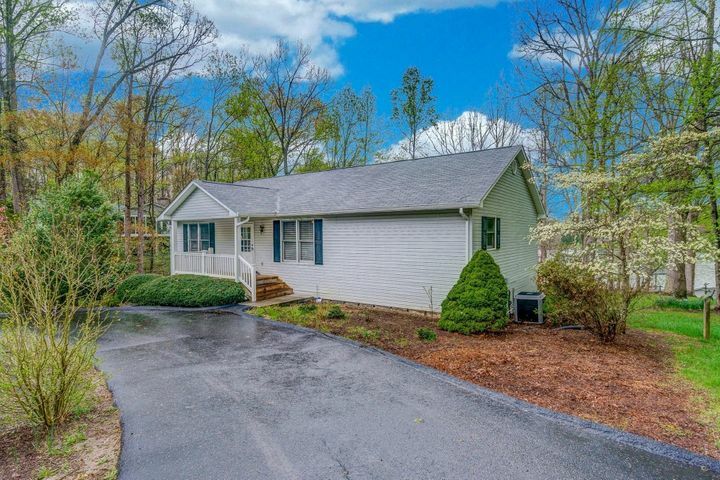 This home has a detached garage as well as a boat garage and two docks. In the paved driveway there is room for up to 10 cars, so invite your friends for a visit! 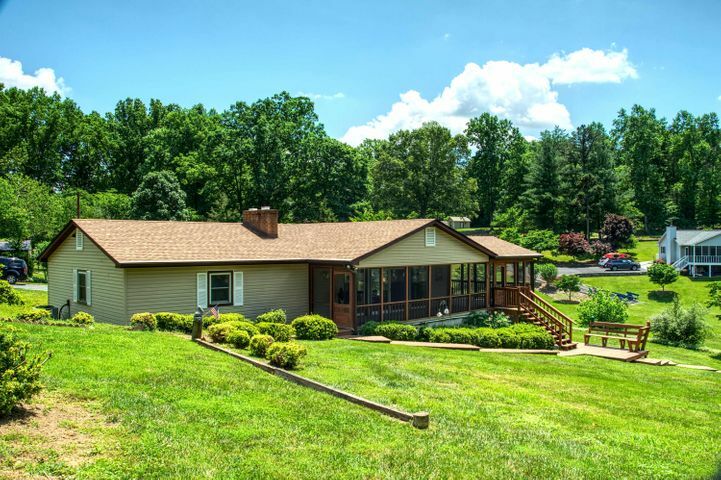 With a new roof and lots of space both indoors and out, 333 Brooks Point Lane won’t last long, so schedule your showing today and find yourself at home on Smith Mountain Lake. 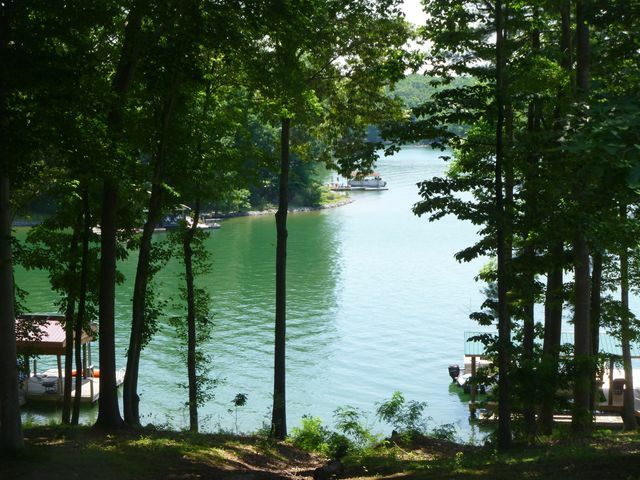 On Smith Mountain Lake in the lovely town of Union Hall, Virginia, there’s a property you simply can’t ignore. 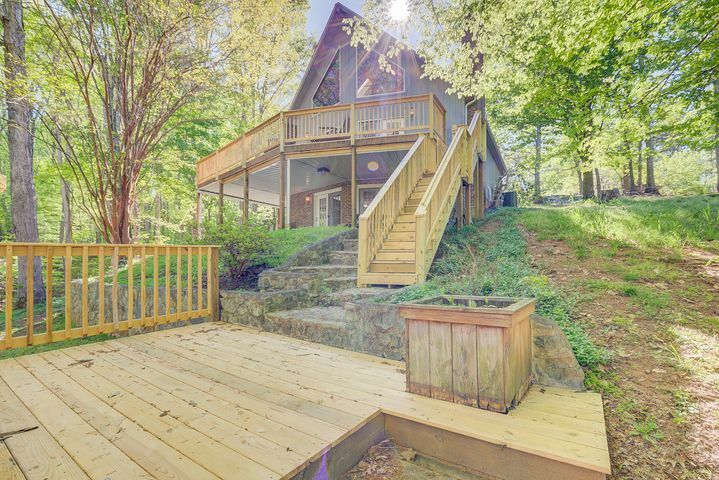 With four bedrooms and three baths with stunning views of the water, 353 Ivy Lake Lane may be just the place you are looking for. Imagine this: Upon walking in the front door, you are greeted by a large stone fireplace and cathedral ceilings that make this already spacious 3,023 square foot home seem even larger. (If that’s even possible. The bright kitchen continues this trend with ample cabinet space before giving way to a sunroom and a screened porch. 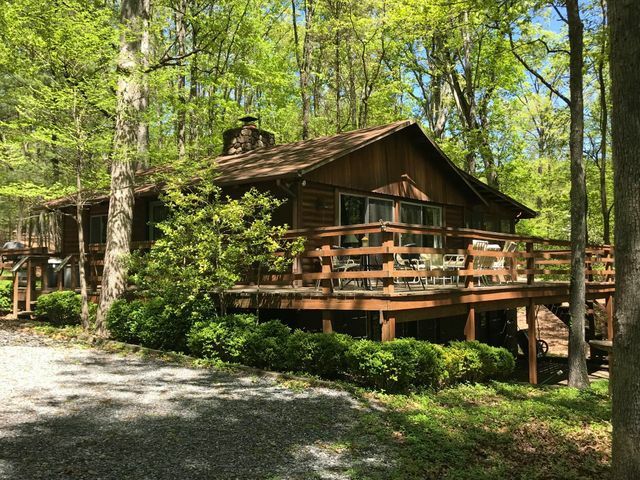 The rooms toward the back of the house have nice, large windows which let in just the right amount of natural light while offering stellar views of the lake all while boasting gorgeous hardwood floors. Two full bathrooms are on the main level, as well as two bedrooms. The master has a large walk-in closet and its own personal bathroom with an amazing soaking tub. There is plenty of space to gather in the family room downstairs, and you’ll also find two more bedrooms here to fit family or friends. The house itself is impressive, but what you really want is just outside those patio doors. 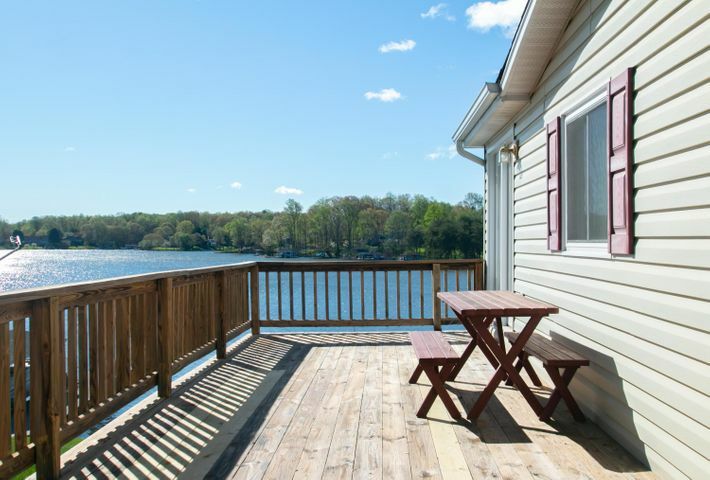 Each level has a nice long deck with views of Smith Mountain Lake. The covered porch is a beautiful spot to enjoy your morning coffee or to take in the cool breeze from the water at twilight. The sprawling lawn below slopes gently down towards the water where a floating dock with a roof awaits to welcome your boat home. To make things easier on you, there’s even an outdoor shower to clean everyone up before they head back into your immaculate home. So what are you waiting for? It’s time to dive in. 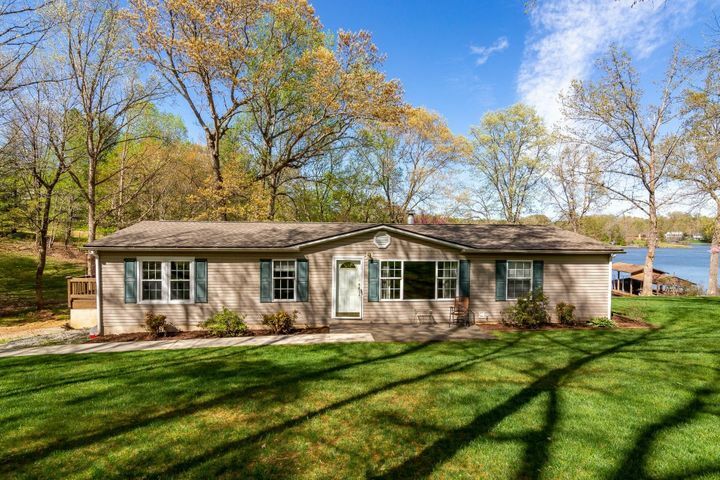 Call me up to schedule your personal showing of this amazing property at 353 Ivy Lane today.